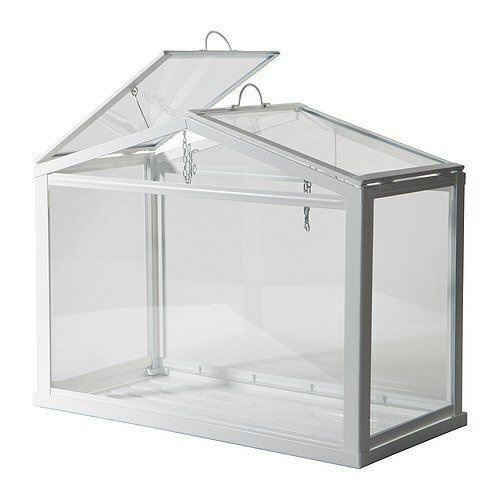 At $20 this IKEA Socker Greenhouse is priced right to make a great container for your more sensitive plants in need of a humid environment. Thanks to Alyssa for the tip! These are really great if you tweak them a bit. I have a number of these with various tweaks and I use them when I conduct a workshop or class. If your style is the stark, clean lines of Scandinavian modern then the only tweak you'll need is to spray the inside of the bottom tray with with Polyurethane spray (use the Krylon brand and not minwax), being sure to get in the nooks and crannies . Use at least four (4) coats, allowing the Polyurethane to dry for at least four (4) hours between coats. If you intend to use the upper part outside as a cloche as intended you will need to use masking tape to cover the "glass" inside and out and spray the white frame inside and out with a clear spray sealant (at least 2 coats) to prevent it from rusting ( a word of advice here, after applying each coat of paint you will need to manipulate the top doors open and closed periodically so the hinges do not become locked in one position or another) or you can use it a bit as is and allow it to rust a bit before sealing it. If Scandinavian modern isn't your style you can tweak it more and make it look more like a Victorian or Edwardian piece. Use Masking tape to cover the "glass" inside and out and try to get the tape under the edges of the metal frame. Use a bit of sand paper to rough up the white paint a bit. At this point you have a lot of options. One option is to use either a can of Matte Black spray paint or Chalky finish Black sprat paint. Spray the metal frame and and the bottom tray ( I use at least three coats allowing each coat to dry before applying the next coat). Now you have what looks like a wrought iron piece. If you like the way it looks you can go on to sealing it or you can use a small amount of white paint brushed on wiped off leaving some streaking and blotching to give it a distressed look, if you like. After you have applied the desired number of coats to the bottom tray spray the inside with at least four (4) coats of Polyurethane to seal the tray from rusting. If it will be seeing anytime out of doors you will either need to seal it with a clear spray sealant or the Polyurethane. If you want it look like an old lead piece you can use a Matte Grey or Chalky Grey spray paint and follow the instructions for the wrought iron look. You can get a really formal look by using metallic spray paint in gold, silver, copper of brass. once you've applied the desired number of coats of paint you can either seal it at this point or you can brush on dark brown or black paint (I prefer dark brown) and wipe it off leaving streaks and blotches to give an antiqued effect. Or, at this point you can use a chalky spray paint in a light green or light blue and spray it over the metallic paint. Once the chalky paint coats have dried use a little fine sand paper on the edges and here and there to bring up the metallic paint from below to give the look of verdigris. At this point you can seal it as already explained. Now you can use it to display a collection of small plants like mini cyclamen, mini African Violets, small ferns or whatever you like in tiny terracotta pots. I use small terracotta saucers under the pots or small plastic containers like the ones used for individual servings of apple sauce or for condiments for the smallest pots for plants like cyclamen or African Violets that need to be watered from below. After you arrange the pots to your liking cover the bottom with an inch to three inches of shredded pine bark or orchid bark to give it a more finished look. If you want to use it as a natural terrarium you will need just a few more tweaks after you seal the bottom tray with Polyurethane. run a bead of silicone (aquarium cement) along the bottom edge and bottom outside of the frame of the cloche part and place it in the tray and allow it to dry. Use the silicone to run a bead along the inside of the edge of cloche and allow it to dry. Now you're ready to add your planting medium. I start with a quarter of and inch of washed play sand (available from Home Depot) mixed with activated carbon (available from any pet or aquarium shop). Next add an inch to two inches of a mixture of 50% Perlite (avoid Perlite with added fertilizer loke Miracle-Gro) and 50% small pebbles (I use the unwashed pebbles builders use from Home Depot and wash them in buckets with the hose outside) mixed with a quarter to half cup of activated carbon. At this point I put in a thin layer of Mosser Lee Long fiber Sphagnum Moss soaked in distilled or rain water (New Zealand Sphagnum is just too expensive for this), it acts as a wick for the soil above. At this point I use plastic canvas, cut to fit, between the Sphagnum and the soil layer because it allows any fine foots to go through it while keeping the soil from mixing with the lower layers. At this point you need to decide what plants you want in your terrarium, you'll need to do a little research here (my suggestion is that you start with one plant that you have to have and then add other plants that require the same conditions as that first "have to have" plant). Now that you have a group of plants that require the same environment (soil, water, Light, pH, etc) you need to tailor your soil mix to the plants you are putting into your terrarium, trying to force plants into an environment that doesn't take their needs into account is a sure recipe for failure. Avoid potting soils or any other component for your soil mix that has fertilizer in it, you don't want your plants to outgrow your terrarium and there is nowhere for the excess fertilizer to be flushed away to. A good basic soil mix to start out with is 2 parts potting soil, 1 part leaf mold (leaf mold is best, but packaged compost could be used in a pinch), 1 part grit (the kind used for poultry or cage birds, not sand. Grit opens up the soil more). If you're growing plants that require a more acidic soil, replace one part of the potting soil with peat moss soaked in distilled or rain water (never use tap water in a terrarium, mineral salts will build up and make a toxic environment for the plants, especially acid loving plants), never use dry peat moss because it draws moisture from the surrounding soil if it isn't soaked before hand or 1/2 part soaked peat moss and 1/2 part soil from under an established pine or a pine forest.